Blog-ah: Will 3rd Bde Extend in Iraq? Will 3rd Bde Extend in Iraq? 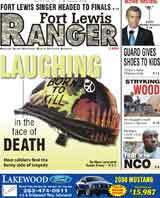 The Army announced today the extension of one Army Brigade in Iraq, but made no mention of extending the 3rd Brigade, 2nd ID from Fort Lewis scheduled to return to Fort Lewis this summer. Standby. Below is the Army release from this morning. (Army News Release) - The Department of the Army confirmed today the Department of Defense's announcement for the next rotation of one corps headquarters, two division headquarters and two brigade combat teams in support of Operation Iraqi Freedom. Additionally, the Department of Defense extended one unit in Iraq and added approximately 2,000 combat support Soldiers to maintain the momentum of operations. The XVIII Airborne Corps Headquarters, from Fort Bragg, N.C., will replace Headquarters, III Corps, of Fort Hood, Texas, as the Multi-National Corps - Iraq Headquarters in November 2007. The Multi-National Corps Headquarters element oversees day-to-day operations in Iraq, and this deployment of a corps headquarters and some of its subordinate elements is part of a routinely scheduled rotation of forces. No stranger to this mission, the XVIII Airborne Corps Headquarters last saw duty as the Multi-National Corps Headquarters from February 2005 - February 2006. The 1st Armored Division Headquarters from Wiesbaden, Germany and the 4th Infantry Division Headquarters from Fort Hood, Texas, will deploy to Iraq in August 2007, and serve as multi-national force headquarters, assuming command and control of units and areas of operation as directed. Germany's "Old Ironsides" Division Headquarters last served in Iraq from April 2003 to August 2004 and Fort Hood's "Ivy Division" recently returned from an OIF deployment that started in December 2005 and ended this past December 2006. The two brigade combat teams confirmed as part of the regular rotation to Iraq are the 1st Brigade Combat Team, 10th Mountain Division from Fort Drum, N.Y. and the 1st Brigade Combat Team, 82nd Airborne Division from Fort Bragg, N.C. (The Department of Defense previously announced this 82nd Airborne brigade's deployment Nov. 17, 2006.) Both Brigade Combat Teams are seasoned veterans of Afghanistan and Iraq. The "Warriors" of 1st BCT, 10th Mountain Division completed their latest OIF rotation in August 2006, and had served in Afghanistan from June 2003 to May 2004. The "Devils in Baggy Pants" from Fort Bragg served in Iraq from September 2003 to April 2004, and twice in Afghanistan from December 2002 to May 2003 and June 2005 to March 2006. The Headquarters, 25th Infantry Division from Schofield Barracks, Hawaii, currently serving as Headquarters, Multi-National Division North, is extended 46 days past an anticipated 12-month rotation end date. These "Tropic Lightning" Headquarters Soldiers will now redeploy in September 2007. The 2nd Brigade Combat Team, 82nd Airborne Division, Fort Bragg, N.C., which was the first unit called forward from Kuwait as part of the Operation Iraqi Freedom plus-up operations, deployed from Fort Bragg in early January 2007. Though tentatively scheduled to redeploy in September 2007, they will now complete a full 12-month rotation and return in early January 2008. The Army is also supplying an additional headquarters unit for the plus-up, the Headquarters, 214th Fires Brigade, from Fort Sill, Okla., placing additional combat support capability in theater. This headquarters will plan, coordinate and synchronize lethal and non-lethal effects for operational commanders. The 214th HQ is trained and ready, and will deploy at the end of this month. Combat support and security operations remain keys to success on the ground, and the Army is answering theater's call to provide more of these capabilities. For these latest requirements, the Army National Guard will provide headquarters and line batteries from the 181st Field Artillery Battalion, 145th Field Artillery Battalion and the 131st Field Artillery Battalion, all Army National Guard units. The incredible Citizen-Soldiers who comprise these units hail from the states of Tennessee, Utah, Texas, Kansas, and Georgia. They will deploy this September. The Army will only provide the best led, best trained and best equipped forces possible to the combatant commander for operations in Iraq and Afghanistan. Though increasingly a challenge, the Army also remains committed to carving out the critical 12 months of dwell time for units, Soldiers, and families between combat rotations. This dwell time is required to properly organize, re-train, and re-equip forces, as well as allow Soldiers and their families well-deserved rest. Where the 12-month dwell is broken, and where unanticipated extensions are ordered, the Army will focus all available resources on those units, posts, Soldiers and family members to ease the challenges these conditions bring. Soldiers and family members continue to make great sacrifices for the good of our country and in response to theater requirements. America's Soldiers are performing magnificently around the world during this time of war, and they appreciate and acknowledge the continued support of the American People. I am wondering if we know anything about when the 2 brigade 82nd airborne will be heading home- I know Petraeus mentioned a possible in Dec. but since its mid November and we've heard nothing I am guessing that is not happening... so we have a month that they will be returning in mind? Or will it be a full 15 until April. I can only find extensions for them for a year! Help! Haha.